Advertising on commercial radio isn’t just about the spot ads that you hear during the traditional ad break. Branded Content allows advertisers to take advantage of various other creative opportunities and partnerships that stations are able to offer and benefit from the close relationship between listener and presenter. Branded content is any on-air activity that takes place outside of the spot advertising break e.g. sponsorships, promotions and advertiser-funded programming elements. The regulations permit for brands/products to be endorsed on-air within radio programming by presenters or brand ambassadors – provided it is transparent to listeners that a commercial arrangement is in place. Branded content allows advertising a greater level of integration into station content through the development of new and creative mechanics. Radio has always had high levels of trust, and branded content allows advertisers to benefit from the unique relationship radio stations enjoy with millions of listeners every day. 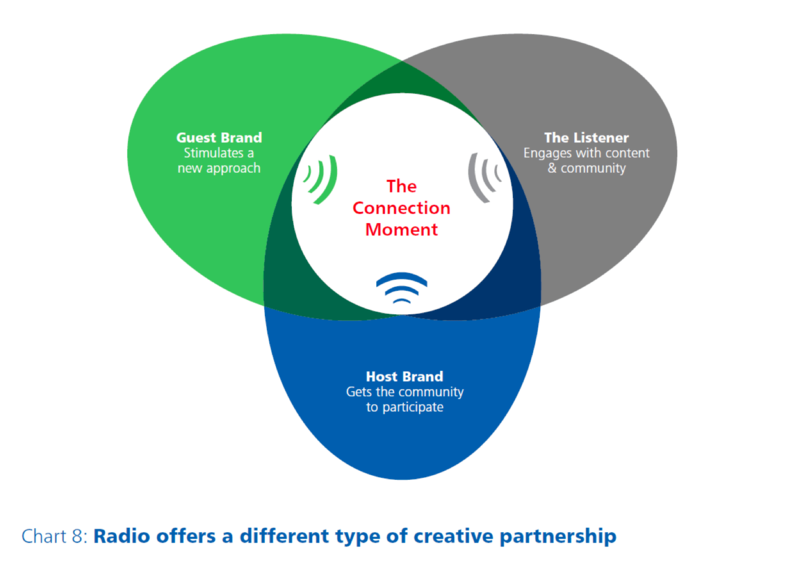 This means that radio can deliver unique and powerful partnerships in ways that no other broadcast medium can. The best radio branded content projects require the input of people on both the sales and programming side of the radio station. It is vitally important therefore that everyone involved in the development process has a clear understanding of the strategic background to the project: in particular, about the brand and what it aims to achieve. As with most things in the marketing world, this places a huge responsibility on the quality of the brief. Simplicity: keep the brief clear and concise and avoid unnecessary marketing speak/jargon. Try to limit information to that which is relevant to or will help in the development of the radio branded content idea. Allow room in the brief for the radio groups to develop ideas. Focus: ensure that the brief is very clear about the marketing challenge that the radio branded content needs to address, and how this relates to other marketing activity. Time: allow enough time for the station groups to consider the brief and develop ideas before responding. In general, a time frame of two weeks between brief and response should be enough to allow the station to involve the right people in the development process. To explore how advertisers have used branded content opportunities on radio please explore our case study database.